Larry Boyington here in OKC. Love your website and news on the oldies. Got a rhetorical question for you.Through the years, people I know and sometimes I don't know, come up to me and ask me if I know the name of the artist or group that did a particular song or maybe they know the group or artist and want to know the name of a song that singer did. I like to think my knowledge of the music is above average and I help them the majority of the time. Do any of your readers occasionally write in wanting to know the title of a song, if the artist or group is know, or possibly if the title is known, then who sang it? The past week, I have discovered on you tube videos two songs in which the person who had the website wanted to know if anyone knew the titles o48the songs. Now they were both instrumentals and that makes it tougher. No lyrics to maybe come up with a title. Some instrumentals may be familiar with people but can't place a title. Also, through the years, there has been songs in which the title of the song is not included in the lyrics of the song. I am loving your focus on Summer Hits! In keeping with the summer, I'm looking for an aircheck or clip of the famous "Sun-in" hair lightener spot that ran everywhere in the early -to - mid 70s. It was a singing jingle, "Sun-in and sunlight, and you'll be blonder tonight ..." Do you know who might be a source for a spot like this? I have a customer who is looking to get one survey from every station that ever put one out. Obviously the earlier and smaller the market the better. I'm unsure if copies will do but I will find out. Also, can you please put me in touch with the one DJ who's doing the obscure Chicago area bands / performers. I've been thinking about compiling a list of the top 40 Chicago songs of all time, (if there are that many) and would like a list of artists he has featured, in case I forget anybody. Thanks. Should we reprint our Sixties Chart Book? Help us make the decision. To Reprint or Not To Reprint ... It's Up To You! You can get a New, Deluxe Edition of "Hot 100 Charts: The Sixties" for just $79.95 hot off the press! Or a used copy from an online retailer for $300 or more! It's your call ... Call us and we WILL reprint. Here's your chance to have a deluxe 8-1/2" x 11" hardcover edition of this long out-of-print collectors' favorite for only $79.95. Used copies sell with online retailers for $300 or more! Straight from the pages of Billboard -- every weekly "Hot 100" music chart, from January 1960 through December 1969, reproduced in black and white at about 70% of its original size. But before we can commit to a costly reprint, we need a commitment to order from you. If we reach our print quota, you will then be charged and we will reprint. If our quota is not met, you will not be charged. So, tell your friends who also have a heart for the charts and CALL TODAY to reserve your copy. Click here to see a sample page from Billboard Hot 100 Charts: The Sixties. Great job as always with the site. Reading it is one of the highlights of my week. Just wanted to give you some more background on your Lulu discovery. “Inside Thing” is a mashup with Sir Paul she released back in 2002 on her “comeback” UK album “Together” comprised of duets with legends (Sir Paul, Cliff Richard, Elton John, Sting) and some more dubious of the moment British “stars” (Atomic Kitten, Samantha Mumba, Westlife, Ronan Keating) covering classic songs. The album never got a stateside release back then despite going to number four on the UK album charts, spawning a top 10 single with her Ronan duet of Bob Seger’s “We’ve Got Tonight”, and going gold on the back of a TV special. Still it’s a fairly decent listen but the highlight for me is her version of the Beach Boys “Sail On Sailor” with Sting. I’d send you a you tube link that used to be up from her special but it’s been removed. It is available via her Greatest Hits album on I-tunes however, and overall a much more consistent listen as it spans the entire course of her career. >>>Hi! My name Is Francis Ortiz ... I came across your website and found some info on the Youngtones and was wondering if you had any info on that guy named Jocco?? See, because my dad is the dark one from the Youngtones and he is always talking about the group and singing the songs ... and I would love to reunite my dad with some of his old buddies. My dad would be so happy ... so any info would be greatly appreciated. I know with security and all it would be hard for you to give me his info but I'm sending you my email address so please give it to him and ask him to please contact me. Literally 30 minutes after forwarding this note to Jocco, I heard back from both parties ... and now, after who knows HOW many years, these folks have connected again. What do I say and how? I have been watching your website for several years, hoping to get information on him, Jocco, The Youngtones, etc. ... Well, that day has come and after lunch and now this evening dinner ... I don't even know where to begin to thank you. I contacted the woman who was on your site and she gave me my fathers e-mail address. Sent him an e-note, we met and it has been great ever since. I never knew about his ambitions ... the ranch that he has for handicapped children in Nevada ... and when I gave him all the photos from Brooklyn of the different fellows, he welled up with tears ... and those tears were enough. He now may have found another former group member in upstate New York and I will let you know. Thank you for finding my father. Looks like we've got another "hit" on our hands!!! The GOOD news is, she'll pick up the countdown at #20 on Thursday Night. The fun begins at 7pm sharp! BE THERE or BE SQUARE, darlings!! So thanks again to everybody who participated in this special countdown ... we really do appreciate it! I thought Scott Shannon did a superb job of counting down The Top 20 Summer Favorites and loved how he talked about some of his OWN summer favorites that didn't make the list. (I'm sure you'll be hearing from quite a few of your readers who were disappointed not to see some of their favorites make The Top 40 ... but that was a pretty "primo" list to be part of!) I especially enjoyed when Scott played his own recording of "Here Comes Summer" from the early '70's ... that's not a song you usually hear on the radio and I really can't even imagine him playing it in any other context ... so your countdown provided the PERFECT forum for him to toot his own horn a little bit ... and even play part of the B-Side of that record, featuring "Super Shan" on lead vocals! All-in-all, I found it VERY enjoyable listening -- I didn't want to miss a minute -- and THAT, as you always tell us, makes for good "appointment" radio! Thanks again for all you do in Forgotten Hits --- and thanks for including your readers as part of the process. That Does Include ... "
Up On The Roof by The Drifters??? Palisades Park by Freddy Cannon??? Walking On Sunshine by Katrina and the Waves??? I Live For The Sun by The Sunrays??? Sunny Afternoon by The Kinks??? So Much In Love by The Tymes??? Itsy Bitsy Teenie Weenie Yellow Polka-Dot Bikini by Brian Hyland??? California Dreamin' by The Mamas and the Papas??? What’s “Under The Boardwalk” chopped liver? The Top 40 Summer Hits list had no doo wop songs in it. Is it lost forever to the generations? "One Summer Night", by the Danleers, deserved to be on that list. Is it just that old geezers don't own computers? I doubt it. I hope this current generation, and the future generations, don't lose sight of the roots of today's music. Many deserving doo wop groups were never inducted into the Rock & Roll Hall of Fame, and most radio oldies shows don't play doo wop anymore. Such a shame and such a loss. Good list -- if somewhat predictable. I'd sure like to know where some of the other "less obvious" songs came in. Great summer list, Kent. Thanks for all the work compiling it. Any chance of sharing, say, the next 60 or so finishers on the site sometime soon? I'm sure others are curious, too, of where some of their other favorites finished. I enjoyed looking over the compilation of top 50 hits for the Summer of 1968 you have currently on your website. Basically, the same records were played here in the OKC area and were real big as well. The one exception would be James Brown's LICKING STICK. I have a copy of that song on an album but not single. Without going to go check my surveys, I don't think it was even played or made the local survey. Years ago I worked for a station here in town in which they had on the bulletin board in the control room a list of artists, (mostly black), they did not want their songs to be played on the air. This began around the late sixties and early seventies.I never was a big fan of Harris' MACARTHUR PARK. I had a DJ friend of mine tell me years ago (and I might add I had also read this) that one reason it was a hit was because of the length of the record. It was a 7:20 on the Dunhill Record Label. While the record was playing, an announcer if he wanted to, could run out and use the restroom, run downstairs and get a candy bar, coke, etc. out of a vending machine. A similar story or record occurred in 1959 when Nina Simone recorded the song I LOVES YOU PORGY on Bethleham Records. When promotional copies of that record made it to radio stations, DJ'S noticed the length of the song which was over 4 minutes. That was an unusual length for a song back in those days. They started to play it because that would give them more time for other things to do since most records back in those days were a little over 2 minutes in length average. As I mentioned, I never really liked Harris'MACARTHUR PARK but to me the best part was when it hit the 7:20 mark. One final thing. Through the years have you ever noticed or were told that certain songs by artists or groups on the single version was a little bit different than the LP version? For example, the Clovers' 1959 recording of Love POTION #9 single ends differently than the version on their album. I just looked at the Summer All Time Top 40 and wanted to pass along some information about Summer in the City. One of the hooks of that record was the part played on what I believe was a Wurlitzer electric piano. That part was played by my friend Jimmy Czak, the recording engineer on the date. To my best recollection, Jimmy came up with the part at the session. Jimmy and John Post are the owners of Nola Sound Studios in New York City. The record was recorded at the studio where Jimmy worked in the 60s; May have been Bell Sound ... or Bell (???) Anyway, I was always curious as to who played on records, (before credits were listed) As a session player, this was important to me. 6/21/10 = First Day of Summer. It start's at 7:28 a m.
Hope you're up to enjoy it. lol! The good news: Thursday night at 7 pm ET we will continue with the TOP TWENTY COUNTDOWN of the ALL-TIME FAVORITE SONGS OF SUMMER!! Just as I got to number 19 - I swear - I couldn't hold the stream. After numerous attempts - my "ping" was outrageous (2000 ms at one point!) - I gave up. The good news is I am going to play the Top Twenty on my Thursday show ... so the fun continues on! I did receive a lot of positive comments and even had listeners as far away as Australia and eastern Europe tuning in to hear the show! I meant what I said on the air ... I love your website. You are an amazing guy for doing this. I feel a very strong connection to your site because it is the music I play, the music I grew up with, and the music that changed the world. And I agree ... the tired, worn out oldies that standard oldies radio stations play do not accurately represent the music that was, and is, ours. Thank you for keeping it alive and in our hearts. ... for the success of the great response to the songs of summer. They will never go out of style. What a blast to see an often unheralded Beach Boy song, All Summer Long, high on the list. Plus, California Nights by Leslie Gore, another great but seldom heard song. Not making the list but guaranteed to send you into summer ... two Beach Boys tunes: It's OK (70's) and Keepin' the Summer Alive (80's). Well, THAT didn't take long!!! Less than 24 hours after telling The Las Vegas Sun that The Beach Boys (including original members Brian Wilson, Mike Love, Al Jardine and long-time member Bruce Johnston) would be reuniting for a 50th Anniversary Tour, Mike Love spent a good part of yesterday back-pedaling from that statement. Quite honestly, I never REALLY believed it for a minute ... I just reporting what was reported ... in my mind, unless Brian said they were doing it, it didn't count ... and even then, I would fully expect them to abort ship after four or five dates when they realized that they simply could not coexist sharing the spotlight. Let's face it, Brian Wilson has been doing just FINE without the others for several years now ... this would no longer be a case of Mike wheeling Brian on stage and propping him up behind the piano simply for appearances sake ... despite his long-standing disdain for touring, Wilson has put on some legendary and landmark shows of his own for the past decade and a half ... with an absolutely STELLAR back-up band that loves and appreciates his music. Unless Brian announced the band was reforming for this very special anniversary, this always ranked as more of a "PR" move (or perhaps some wishful thinking) on Mike Love's part. I'm praying the Mike Love quote is more than his wishful thinking! Could There Be Better News On The First Day of Summer??? After decades of bad blood, recriminations and law suits, Brian Wilson is set to reunite with the other surviving members of the Beach Boys -- Mike Love and Al Jardine -- to mark the 50th anniversary of the band's inception, according to comments by Love in the Las Vegas Sun. Love still performs under the Beach Boys name alongside another veteran member, Bruce Johnston. Wilson made a triumphant return to the spotlight in 2002 when he performed the 'Pet Sounds' album in full at London's Royal Festival Hall, and in 2004 performed his incomplete masterpiece 'Smile' at the same venue. He has sporadically toured since then. Love said, "We're gearing up for the 50th anniversary and Brian Wilson, who has been working on some unfinished Gershwin music project, will rejoin us. "I'm sad that Carl Wilson passed away 11, 12 years ago from the same lung cancer problem that claimed the life of George Harrison. That was not a fun time for us." The surviving Beach Boys last appeared publicly in 2006 for a press conference marking 40 years since 'Pet Sounds'. Of the original members, Carl Wilson died of cancer in 1998 and Dennis Wilson drowned in 1983. Love, who once described 'Smile' as a "whole album of Brian's madness," also spoke about the current incarnation of the Beach Boys, saying, "We're still out there doing 150 shows a year, and the sound has reached all the way around the globe. Close your eyes and not only do we today replicate exactly how the original songs sounded, but the technology has gotten better so we even sound better. Yes, the line-up has changed over the years, but it's been pretty consistent the past several years." We found songs ABOUT Summer ... songs that were big hits DURING the Summer ... songs with Summer in the title ... and feel-good songs that just evoke the feeling of a carefree, fun-loving summer day. And, as we told our readers all along, that is EXACTLY what we were looking for! My original inspiration for this feature came after reading a similar poll held in "Entertainment Weekly" back in 1999, when their writers got together in order to determine THEIR list of Summer Favorites. The only problem with a list like that (when put together by a bunch of writers who are trying to look just a little bit more sophisticated than their average reader) is that they tend to be a little "artsy" simply for artsy's sake ... it seems that quite often these writers will go out of their way to name something SO far off the beaten path that most people reading the article won't ever have even heard the song!!! Now sometimes there's a hidden benefit to this ... SOME readers will actually seek out some of this music that they weren't familiar with and see if it really stacks up against the best Summer Songs that ran across their own minds ... but what I've found over the years of doing these Forgotten Hits Polls is that, for the most part anyway, we all pretty much like and identify with the same music. Really GOOD music moves us ... leaves a mark that stays with us forever ... as you'll see, the biggest portion of these songs are somewhere in the neighborhood of forty years old ... yet these STILL elicit a special feeling of summer excitement, no matter HOW many times we've heard them. In 2006, we decided to ask our readers again to vote for their All-Time Summer Favorites. This time about 2100 people responded ... yet the majority of The Top Ten remained the same. Hmmm ... maybe a trend was beginning to develop here ... maybe these really ARE the All-Time Summer Favorites. poll ... yet it's been a different song each time that earned this honor. Thanks again to everyone who took the time to vote. Be sure to check out The Forgotten Hits Website for more "Favorites" polls! And now you can listen to hear Your All-Time Top 40 Summer Favorites on the radio! Now ... not all the songs I voted for say Summer but most imply them if not outright mentioning summer. I'm sure there are a bajillion hit songs that made it big on the airwaves during summer, but I never remember when a song was a hit (month or even year) and I did not mention all the Beach Boys, Jan and Dean songs (Catch a Wave, Surfer Girl) because I consider almost all of their songs "summery" I tried to mix it up a bit. IT'S A SUMMERTIME BLAST-OFF MONDAY ON THE TOC ... FEATURING THE TOP SUMMER SONGS AS VOTED ON BY THE FANS OF FORGOTTEN HITS!!!! The Forgotten Hits Top 40 Summer Countdown will air on Saturday night June 26th, from 6:00 pm-? Here are the songs I associated with summer, which to me meant getting out of school. 1961 Quarter To Three by U.S. Bonds ... I still think U.S. Bonds is the coolest recording artist name EVER. I don't understand why Gary Anderson later dissociated himself from this name and this song. 1961 Pomp And Circumstance by Adrian Kimberley ... my sentiments, exactly. 1961 Summertime by the Marcels ... The Marcels did show tunes the way they were meant to be done. 1962 Party Lights by Claudine Clark ... Summertime, all your friends are partying and you're grounded ... who can't relate to that? 1963 Easier Said Than Done by the Essex ... Musical superheroes ... protecting our freedom by day, topping the charts by night. 1963 Rev-Up by Manuel & the Renegades ... You had to be in Chicago. 1964 Let's Have A Party by the Rivieras ... I'll go for that. 1964 The Girl From Ipanema by Stan Getz & Astrid Gilberto ... what's a summer without unrequited love? 1965 She's About A Mover by the Sir Douglas Quintet ... On my way to my high school graduation I passed by a band playing this song in their garage, so I associate it with winning my freedom from the hell that was high school. I could add every Beach Boys song, Jan and Dean song, and surf or car instrumental recorded before 1966 but I promised myself I'd stop at ten songs. I am really looking forward to seeing the results of the voting for these great summer songs. I'm sure the other list members will have some very interesting choices!! Waiting with bated breath for the top Summer Songs and telling everyone about it ... love, love, love these favorites lists. I enjoyed reading the interview with Marshall Lytle in the FH Newsletter today. Coincidentally, I bought an entire collection of 45s recently, which included two records by Bill Haley and His Comets. I played them recently on The FLip Side Radio Show. 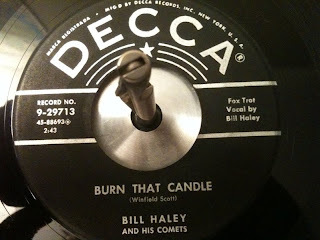 Here's a picture of "Burn That Candle" -- notice "Fox Trot" printed on the label. Honestly I don't know which side is "A" and which is "B." The first one has the songs "Burn That Candle" and "Rock A-Beatin' Boogie." The second record has "Razzle Dazzle" and "Two Hound Dogs." All four songs have that distinctive ticking sound mentioned in the interview, and you just can't play these records without tapping your foot. There's no more accurate description than the one M. Marvin offered: this sounds like the Mamas and Papas dropped in at a Beach Boys session. But it's Glen Campbell on lead? Amazing! I loved reading about "My World Fell Down." "Another Time" is even prettier, if it could possibly be imagined. "Another time / you'll see my face when you're not looking / And turn to me / To answer all the questions in my eyes / Another time ... you'll find me in a game / And ask if you can stay and play along / But another time has come, and already gone ... " Gorgeous lyrics, breathtaking melody and harmonies. It isn't too surprising that the record never went anywhere, but this is what I consider a perfect example of the kind of music we could only get to hear --- in the Sensational 6Ts! Wasn't it Winchester Cathedral that took the Grammy away from Brian Wilson / Beach Boys' Good Vibrations? When that happened back in 1966, MY world fell down! I want to see if I can scoop Ron Smith twice in a week. R.I.P. Jimmy Dean, king olf the breakfast sausage. I also heard that Jimmy's widow is holding an open-to-the-public wake and viewing ... and that the casket will be inscribed "Here lies a hell of a man", a tribute to his #1 Smash "Big Bad John". Jimmy Dean, television host, actor, entrepreneur and country singer who was due to be inducted into the Country Music Hall of Fame in October, died Sunday night (June 13) of natural causes at the age of 81. Born in Olton, Texas in 1928, Jimmy dropped out of high school at the age of 16 and joined the Merchant Marines for two years before enlisting in the Air Force. Stationed at a base in Washington D.C., Jimmy played in an area band, then formed his own after he was discharged. In 1952 he recorded his first single for Four Star Records. "Bummin' Around" reached #5 on the country charts and launched his career. He was offered a local television program, which introduced viewers to artists like Elvis Presley and Patsy Cline. In 1957 he moved to New York to host a morning network program for CBS-TV and signed with Columbia Records. It was then that his spoken-word recordings crossed over to the pop charts. "Big Bad John" in 1961 topped at #1 for five weeks. It was followed by "Dear Ivan" (#24-1962), "The Cajun Queen" (sequel to "Big Bad John" which got to #22 in 1962) and it's flip-side, "To A Sleeping Beauty" (#26-1962) and "P.T. 109" (the World War II story of John F. Kennedy which made #8 in 1962). His last appearance on the pop charts was "I.O.U." (#35) in 1976, though it re-appeared two more times on the country charts. All told, he charted 26 times on the country charts and 14 times on the pop charts. Jimmy was the first guest host of Johnny Carson's "Tonight Show" on NBC-TV and hosted his own variety program, "The Jimmy Dean Show" on ABC from 1963-1966 (where he gave a big break to puppeteer Jim Henson who was later to create the Muppets). He also appeared on TV's "Daniel Boone" and played the villian in the 1971 James Bond film, "Diamonds Are Forever." In the late '60s, he began the Jimmy Dean Meat Company and became the spokesperson for its pork sausage. The company was sold to Sara Lee but he continued to perform in its commercials for twenty more years. I'm deeply saddened to announce the passing of another legend. I considered Jimmy Dean to be the first successful rapper with his classic “Big Bad John”. Although the song was rooted in country music, the “talking blues” approach made it more accessible to a wider audience. Here is the man, the song, and the video! Imagine being able to access an all-star lineup of great Chicago radio personalities hosting a wide array of popular music formats — all for free and on demand. It’s here now: Without fanfare, Kurt Hanson’s Chicago-based AccuRadio.com has launched Chicago Radio Online, a dream lineup of seven distinct formats hosted by some of the most popular local disc jockeys of the past four decades. (Here is the link.) It’s also available as an app for both the iPad and iPhone/iPod Touch platforms. Each format also provides a list of artists that can be customized to individual tastes. Listeners can further tailor the formats by easily skipping over any songs they don’t like. Billed as “the world’s leading independent, multichannel, personalizable Internet radio station,” AccuRadio features more than 430 channels and subchannels of music. The site claims to reach more than 400,000 unique listeners per month (and up to 1,000,000 unique listeners per month during the Christmas season), divided about 60 / 40 male / female and almost equally divided among the 25-34, 35-44, and 45-54 age groups. AccuRadio founder and CEO Hanson’s ambitious plans for expansion got a big boost last December when he brought on John Gehron, the veteran radio executive and revered industry statesman, as lead management consultant. Gehron, who first worked with Hanson at WLS-AM (890) in the ’70s, is leading the company’s efforts to establish online versions of AM and FM stations for terrestrial broadcasters. PLEASE THANK CLARK FOR THOSE PHOTOS ... ALSO FOR THOSE KIND WORDS. I LOVED MAKING THOSE SUMMER RECORDS. WHATS GREAT ABOUT YOUR PAGE KENT, YOU ALWAYS DO YOU HOME WORK! Thanks Kent. I am sure I have tons of Freddy photos (as well as most all of his 45s), so I will send these once in awhile when doing CD research. He's one of the classics. His songs really make you happy like many do not. HAPPY BIRTHDAY TO SIR PAUL McCARTNEY TODAY! The former Beatle, responsible for writing 32 U.S. chart-toppers (24 in the U.K.), celebrates # 68 today, June 18th! Of the 500-plus songs in his catalogue, Sir Paul chose "Here, There and Everywhere" and "Blackbird" as his two personal favorites! 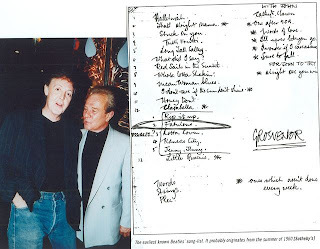 Philly's First Rocker, Charlie Gracie, was in London with Sir Paul a few years back when he covered one of Charlie's hits: "Fabulous," as part of his "Run Devil Run" cd series. McCartney often recalls seeing Gracie when the young Philly rocker headlined at theaters like the Liverpool Empire in the late 1950s. 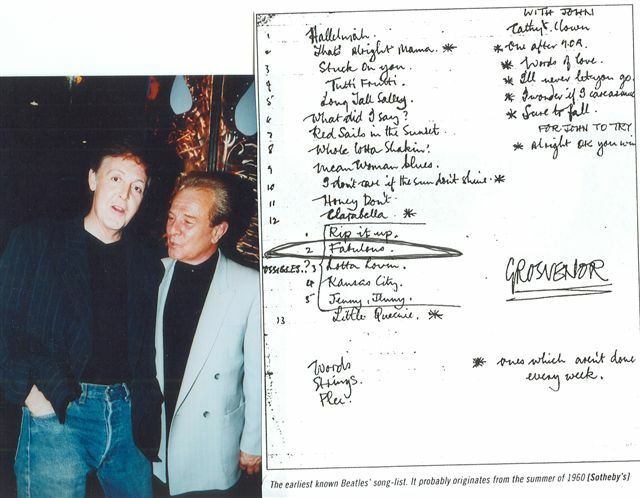 Notice "Fabulous" on the earliest known Beatles' set list dating from 1960 ... and auctioned off by Sotheby's for a healthy sum in the early 2000s. McCartney comments on Charlie's live performace of "Guitar Boogie" in his (Gracie's) upcoming enhanced Cd release this fall entitled: ROCK N ROLL PARTY! The past week, I have discovered on you tube videos two songs in which the person who had the website wanted to know if anyone knew the titles of the songs. Now they were both instrumentals and that makes it tougher. No lyrics to maybe come up with a title. Some instrumentals may be familiar with people but can't place a title. Also, through the years, there has been songs in which the title of the song is not included in the lyrics of the song. Bobby Crafford, a member of Sonny Burgess and Legendary Pacers since 1957. Our band started in 1955 and we recorded on Sun Records and we are still playing 100 dates each year. Terrific website with terrific articles and content! BOY, YOUR LATEST ENTRIES SURE PACKED A PUNCH! I THINK I PLAYED THE JERRY G. BISHOP SONG TEN TIMES IN A ROW! I COULD HEAR THE OUTSIDERS & GARY LEWIS (AMONG OTHERS) INFLUENCES IN THERE! REGARDING YOUR SUMMER HITS LIST, HASN'T ANYONE OUT THERE HEARD OF "CRUISIN' MUSIC" BY THE RASPBERRIES OR "HOT ROD USA" BY THE RIP CHORDS? I'VE ALSO BEEN INVITED TO THE BEACH BOYS RAVINIA SHOW IN SEPTEMBER (MY FIRST IN MANY YEARS), AND FYI ..."YOU BABY" IS ONE OF A HANDFUL OF TUNES I'D CHOOSE TO BRING ON A DESERT ISLAND! REGARDING THE COWSILLS, SUCH SADNESS FOR AN INCREDIBLY TALENTED FAMILY! THEY ALSO HAPPEN TO BE PERSONAL FRIENDS, BUT GEEZ, I CAN'T THINK OF A WORSE ROCK N ROLL NIGHTMARE STORY. GOD BLESS THEM ALL! I REMEMBER MEETING ANITA HUMES BACKSTAGE AT THE 2003 PBS TAPING, SHE WAS SO NERVOUS! AND IF WE KEEP LOSING THEM AT SUCH A QUICK PACE, MY PHOTO BOOKS WILL HAVE TO BE RE-NAMED "ROCK & ROLL HEAVEN"!! Yep, I am LOVIN' hearing that Jerry G. Bishop song again! "Cruisin' Music" by The Raspberries and "Hot Rod USA" both received Summer Favorites votes ... but nowhere near enough to make the list ... great summer songs nonetheless. Your Top 40 All-Time Favorite Songs Of Summer!! !